UPDATE: This restaurant closed on 3/07/09 because of economic reasons and dispute with landlord. 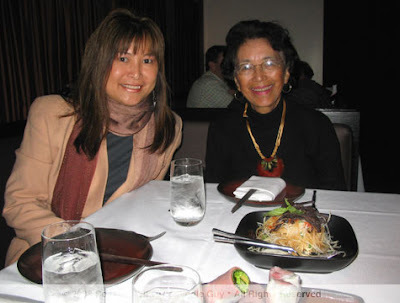 Open for lunch, Monday–Friday, 11:30 a.m.–2:30 p.m.; dinner, Monday–Saturday, 5:30–10 p.m., Sunday, 5–9 p.m.
My friend Margaret from Hawaii was in town this week for some business meetings, so we got together for dinner on Tuesday. I decided to pick a place within walking distance of her SOMA hotel, so I made reservations at Bong Su, the upscale Vietnamese restaurant by the same people behind the popular Tamarine in Palo Alto. Joining us was Margaret’s mother-in-law, Norma. 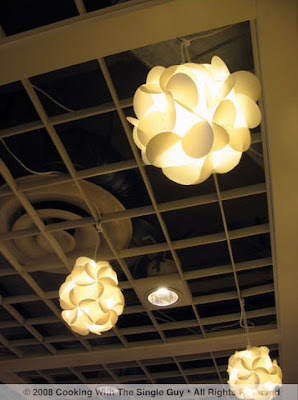 The three of us walked into the restaurant from our brisk walk on an unseasonably cold San Francisco night and were instantly warmed by the cozy, ambient lighting of the restaurant’s tasteful Southeast Asian décor. 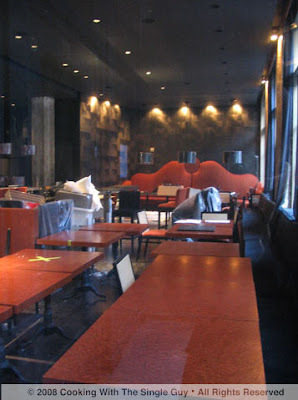 Opened in 2006, Bong Su has a handsome room fit for royalty. You enter and get a quick glimpse of the chic bar area popular during happy hours and turn right into the huge dining room that includes not one but two large communal tables. Margaret, Norma and I were seated in one of the side booths and were warmly greeted by our server, who wasn’t shy about sharing his recommendations from the menu. (OK, we did ask.) Bong Su offers dishes inspired by virtually all regions of Vietnam, from the styles of Hanoi in the north to the exquisite Hue style of Central Vietnam and finally the hearty and more well-known dishes of Ho Chi Minh City/Saigon and the south. Going with our server’s recommendations, we started with the Hot Pot Beef Rolls ($9) and Honey Roasted Quail ($11). (BTW, we were eating family style, which is probably the best way to enjoy the dishes at Bong Su and most Asian restaurants.) I also ordered the papaya salad ($11), one of my favorite standard Vietnamese fare because I loved the light, refreshing taste of the shredded green papaya. Up first was the beef rolls and papaya salad. 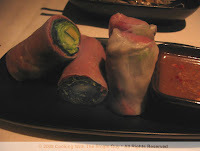 The rolls were fresh-style, which means they weren’t deep-fried like imperial rolls. Thinly sliced Kobe beef were wrapped in the translucent rice paper with a big bunch of greens, including some perilla (Vietnamese version of the Japanese shiso leaves) and cucumber. It came with a sweet-and-sour dipping sauce with pineapples. While filling, I told Margaret that I could barely taste the Kobe beef because it was overpowered by all the vegetables. 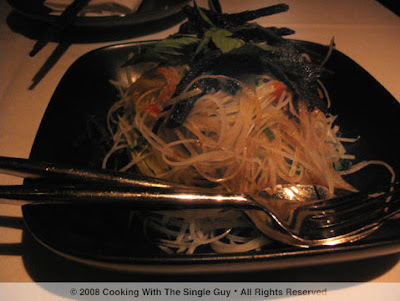 The papaya salad was an elegant presentation of the thinly shredded and crunchy green papaya in a traditional light fish sauce dressing and basil. The chef added strips of dried beef, which I’ve never seen at other Vietnamese restaurants. 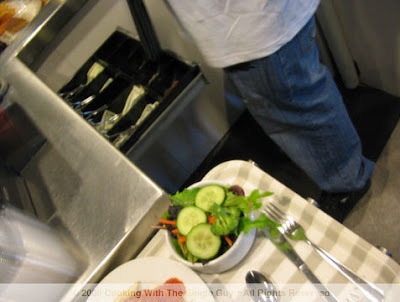 It was a bit like beef jerky and added an interesting twist to the classic papaya salad. Next came the quail, which is a favorite of Margaret. (She says she hardly finds them on the menus at restaurants in Hawaii.) 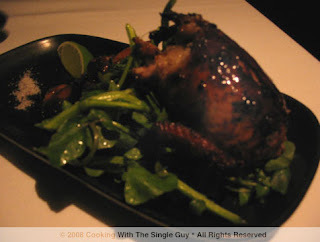 The quail was roasted with five-spice and honey and stuffed with sticky rice. It was cooked perfectly, making it easy to cut into the succulent meat. While the honey glaze was nice, I didn’t find the sticky rice particularly tasty. It could have been taken to another level with more herbs in the rice stuffing, which by itself was simply just sticky. For our entrees I convinced everyone to go with the Caramelized Black Cod ($19) because I still have fond memories of the claypot fish dishes I had from my trip to Vietnam around this time last year. 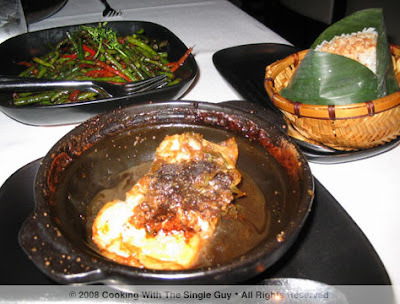 Bong Su’s version used Alaskan cod that was lightly dressed in the caramel sauce made with molasses and served with garlic and green onion. Everyone enjoyed this dish for its clean taste and the perfectly tender way the fish was prepared. We ordered a side dish of Kaffir Long Beans ($8) and steamed rice infused with coconut milk and vanilla ($2). The long beans were on the spicy side cooked in a traditional black bean sauce. We all marveled at the cute presentation of the rice wrapped in bamboo leaf and served in a woven basket. There was a slight hint of coconut, but we weren’t fans of the texture, which was more like rice pilaf than plump rice that holds well together (and would have made it easier to pick up with chopsticks). 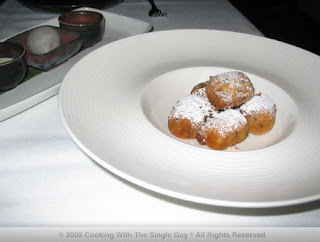 It seems like we had a lot for dinner, but we were able to squeeze in a plate of Bong Su’s beignets for dessert. Tonight it was made with a banana filling and served with black sesame ice cream (which looked kind of dark green) and two sauces: vanilla anglaise and chocolate. The beignets were light and fluffy but the banana filling weighed them down. It would have been better with a banana crème filling, which it was not. (It was more like banana fritters.) The ice cream was a bit icy and the chocolate sauce was unusually sour (and not like a bittersweet chocolate-kind of sour). 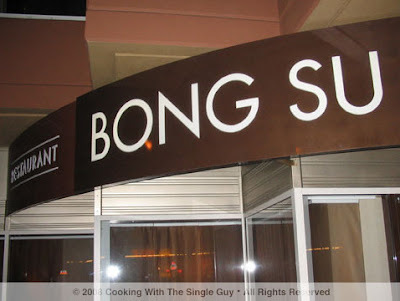 The service at Bong Su was extremely friendly and attentive. (The bus boys pretty much refilled my water glass after every sip I took.) And the room is beautifully done and made everyone dining there seem like they were all in the beautiful crowd. But the food, while prepared with precision and an attention to details, seem to waffle between traditional Asian flavors and the sweet-sour Asian tastes created to cater to an American palate. I preferred the dishes—like the cod in claypot—that were sophisticated but highlighted authentic Vietnamese flavors than the Asian-infused dishes that bordered on sugary. Bong Su can guarantee you an elegant environment with upscale dishes, but it lacks that extra oomph to truly be considered a gem. BTW, thanks to Margaret and Norma for a fun night out. Hopefully I’ll see you when I’m in Honolulu in May! How Far Will You Travel for Tea? The farthest Ive gone for tea is probably London. The most frequent? A toss up between New York and Portland, Oregon. But its nice sometimes when I can find a favorite tea right in my backyard. This particular tea Im featuring is my latest favorite. Its a Red Peony tea that I got from Far Leaves Tea, which has operated a little tea room in the Elmwood neighborhood of Berkeley since 1998. I actually went to Far Leaves a long time ago when it first opened and I remember buying a black tea blend with blood oranges. The tea was overly roasted and the blood oranges were tart. So I never returned. But recently I went to catch a movie with some friends at that old theater on College Avenue. We were early so we popped into the Far Leaves Tea shop. Since my last visit many years ago, Far Leaves has turned more into a lounge than just a shop. It had a big crowd of friends sipping tea at a big table in the front and in the back a bunch of tea zones made up of mats and cushions for people to escape through the tranquility of tea. As I browsed their tea selection, I was captivated by the peony teas. Ive mostly run into white tea made from the peony flower petals, but Far Leaves Tea offers a trio of white, green and red peony teas. I ended up buying the red peony because the description sounded yummy: a sweet black tea with floral undertones. What I especially liked about the peony tea sold at Far Leaves Tea is that theyre tied into tiny bunches, called rosettes. So you can drop the entire rosette into your tea pot (a glass pot is especially nice to slowly watch it unfold) and when youre done just get a pair of chopsticks to pull out the entire thing. No worries about a tea bag, mesh or strainer. 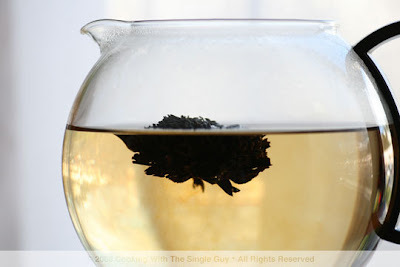 The Red Peony tea is more full bodied that the white peony teas Im used to drinking. Iit has a sweet floral note similar to rose tea, which I love. During the recent wet and cold weather weve been having here in the Bay Area, this Red Peony tea has been great in taking me away to some place far far away. Preferably with in-house massages. Red Peony Tea, $18 for a can with 7 rosettes. Far Leaves Tea, 2979 College Ave., Berkeley. PH: 510.665.9409. Open daily, 11 a.m. to 9 p.m. Web site. Super Bowl XLII is this Sunday, and I for one can’t wait. When millions are glued to their TVs (don’t forget, 6 p.m. Eastern, 3 p.m. Pacific), that’s also the best time to go grocery shopping or catch a movie. Ha! OK, so I know some of you will be watching the game (either Eli following in his brother’s footsteps or the beginning of the Brady Dynasty) and probably preparing to feed some hungry fans. So I decided to come up with the following chili recipe, just because it’s been cold around the Bay Area lately so I wanted to make something comforting. I didn’t really grow up with chili, so I can’t say I know what makes a traditional chili. There’s no Hawaiian standard, although in Hawaii we would eat the chili from this chain called Zippy’s (all you local folks in the islands know what I’m talking about) and their chili always seemed like the meat sauce in spaghetti. I can’t say that my chili is influenced by any particular region. Some might think it has a Southwest flavor because I decided to roast an Anaheim chili and add that in. Some might think it’s more Midwest because I add beans (and according to Tyler Florence, there’s no beans in traditional Texas-style chili). I also made it with two types of meat: beef chuck and ground turkey. I added the beef chuck because I like chili that has small chunks of beef instead of just ground meat. I think this makes it more hearty. But I also added ground turkey because, well, I had some extra in my refrigerator but also because I do often associated chili with ground meat. So you get the best of both worlds (and a whole lot of meat). You might also notice in the recipe that there are no tomatoes, which I found were often put into chili recipes I researched. I actually did buy a can of plum tomatoes and was all ready to add it in. You see, I often keep my recipes fairly simple with very few ingredients. But with chili, you really can’t get away with multiple ingredients because you want a lot of different layers of flavor, especially when concocting your chili spices. Because of that, I was so distracted with cooking the meat and jotting down ingredients as I added them that I forgot to add in the tomatoes until it was too late. But you know what? I didn’t really miss them. I think the tomatoes would have made the chili less brown and more red, and I sometimes associate that color with a beef stew. So since I was going for a really heavy-duty chili (which is why I also added in dark beer), I thought the dark brown coloring in the end was appropriate. You can try it and let me know if I made a touchdown or an incomplete pass. ;-) Enjoy! Start by roasting your Anaheim chili. Place on a gas burner or under a broiler to blacken the chili, then place in a bowl and cover with plastic wrap to seal in the air. Let it sit for about 10 minutes and then remove the chili from the bowl and peel off the blackened skin. Dice the chili and set aside. In a dutch oven or other heavy-bottom pot, warm about 2 tablespoons of olive oil over medium heat and then brown turkey and beef chunks in batches on the stovetop. (You may need to add more oil each time you brown a new batch of meat.) Remove meat from pot and set aside. Add more oil to pot and then sauté onion and garlic until translucent (about 3 to 5 minutes), then add the beer. Cook for about 2 minutes and then add meat back to the pot, along with broth, red bellpepper, Anaheim chili and jalapeno pepper. In a small saucepan, heat the dry ingredients (chili powder, smoked paprika, pepper flakes, cumin and cinnamon) until you can smell them (about two minutes) and then toss everything into your pot with the meat. 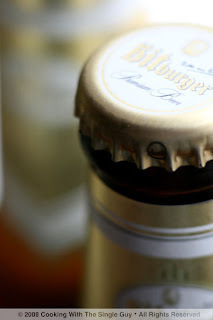 The broth and what’s left of the beer should barely cover the meat in your dutch oven. If there’s not enough liquid, you can add more broth or water so that the meat is barely covered. Cover your pot and place in oven. Cook for 1 hour until meat is tender. Drain and rinse your beans. Also prepare a slurry by mixing flour with a bit of water. After the meat has been cooking for about 40 minutes, take the pot out of the oven and add in your beans, and stir in the flour slurry until blended well. This is probably a good time to season it for taste with salt, pepper and cayenne pepper. (You can also adjust later.) Cover and place the pot back in the oven to finish cooking for another 20 minutes. Remove pot from oven and scoop into bowls. 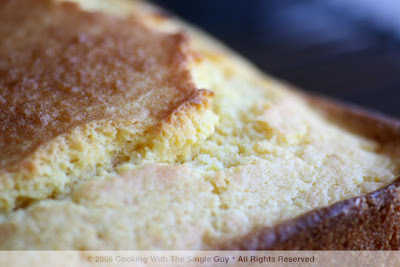 Serve with sour cream, thinly sliced green onions or scallions, grated cheddar cheese and cornbread. Pair with same dark beer used to cook the meat. TIP: It’s important when browning the meat to not crowd your pot. That’s why I note that you should do it in batches. I actually had to do three batches: one time cooking the ground turkey, and two more times cooking the beef chunks in two batches. You want to get a nice seared color on your meat to seal in the juices. HOW HOT IS IT? 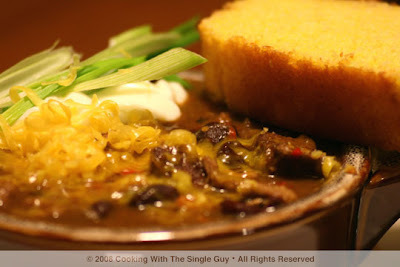 : You can adjust your chili to how hot you want it with the jalapeno and cayenne pepper at the end. For the jalapeno, you can add an extra one if you think one might not be enough. Also, adding the seeds will make it hotter. If you don’t want it too hot, then don’t add the seeds because they contain the heat. ON TOP: While this recipe calls for a dutch oven and slow cooking your meat in the oven, you can also do the same process on the stove top with a heavy bottom pot. Just reduce it to a simmer after you’ve added all the ingredients. It should still take about an hour to cook on the stovetop. If you're here to read the latest summary of the brilliant Jamie At Home series, there's none for this week. That's because yesterday's episode was a replay of an episode the Food Network foolishly used as a "preview" episode before the series even began. Odd American programming! 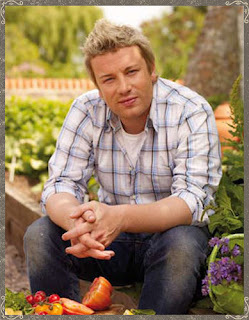 ;-) Anywho, there are five more episodes to go to watch our favorite London bloke (Sir Bloke that is) and I'll be back to the regular summaries next week when the Food Network starts airing new episodes again next Saturday. 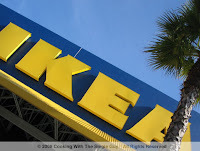 Last weekend I was at the Bay Street Mall in Emeryville so I decided to stroll over to Ikea next door. I was looking for some cheap chili bowls (didnt find any). While I was there, I noticed a long line at the second-floor restaurant. Now, Im not one to shy away from a line. In fact, it always piques my interest. What is worth all the wait? 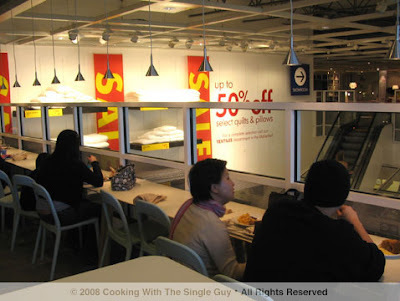 Ive never eaten at the restaurant (its actually more like a cafeteria), but I once went to a party where the host served Swedish meatballs from Ikea, and they were quite delish. 12:23 p.m.I finally get to the part where you enter the queue. 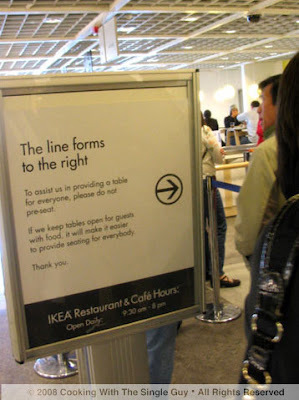 There are a lot of rules eating at the Ikea restaurant. For one, when you read the sign, it says theres no pre-seating allowed. Meaning, no saving tables while your partners suffering through the line and youre just sitting pretty taking up space. I like that rule. 12:30 p.m.This line is sooo slow. Im so bored. Oh, what interesting lighting. I bet you can buy it for a dollar in the store. They kind of look like paper ornaments I use to make in elementary school for the Christmas festival, you know? Then you put glitter designs on each panel. Ah, good times. 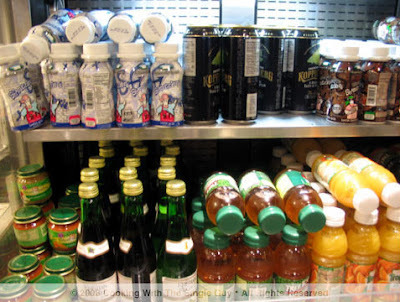 12:35 p.m.I finally get near the front where I can clearly see the signs and start deciding what I want. The overall design is very Euro; I feel like Im at a Swedish airport. like these desserts that I passed on. Thats a Swedish almond torte that really looked like airport food. 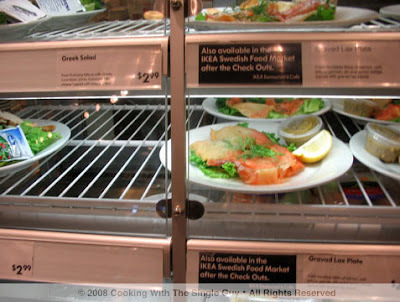 the salad counter also offered up lox plates. I love lox and they were probably good ones from Sweden, but I wanted some meat! Woah, now thats a lot of meatballs. 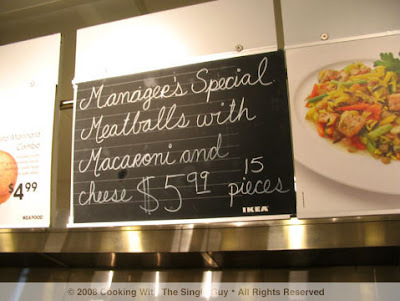 This sign shows that the managers special is Meatballs and Macaroni for $5.99. But do you see those words on the bottom right? Thats right, it says you get 15 pieces. Im pretty sure thats 15 meatball pieces and not 15 pieces of macaroni pasta. 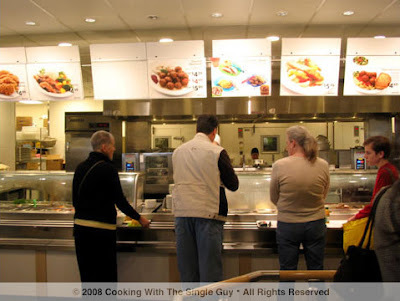 12:40 p.m.I reach the hot counter and finally order my lunch. I decided to get the pasta special, which included a more portion-controlled offering of meatballs. 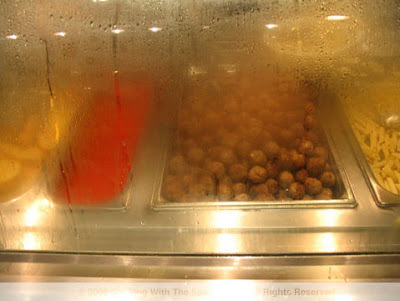 Gosh, the meatballs are really steaming up the counter. You can barely see what youre getting. 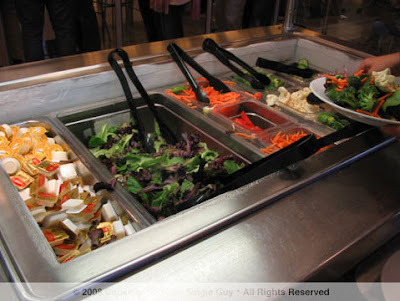 12:41 p.m.Heres the salad bar. My pasta special came with a small side salad. So I assumed I had to create it myself here at the salad bar since the servers didnt give me a salad with my pasta plate. 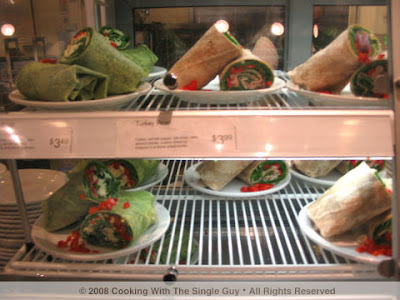 Normally, if you just want to eat a salad its $1.79 for a salad bowl (which is also the same price for the daily soup). 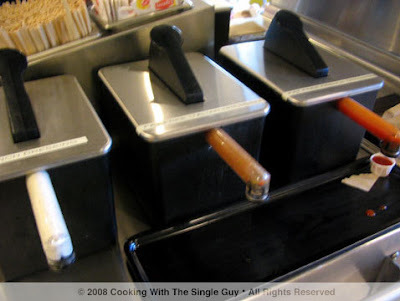 Hey, wheres the dressing? 12:45 p.m.I wasted a few minutes looking for the salad dressing, which is why it took me a total of four minutes before I got up to register. Sorry to the nice lady who was patiently waiting behind me! Anywho, I pay for my pasta special, which was only $4.99. BTW, thats a total of 21 minutes from the start of the line to reaching the registers. Thats just as long as the line at Tartine Bakery! Ah ha! Heres the salad dressing! Theyve got it in these squirt containers near the soda dispensers. Whats odd is that they had regular Ranch, fat-free Italian and fat-free French. Why not make them all fat-free? Whatevs. Heres my pasta special. 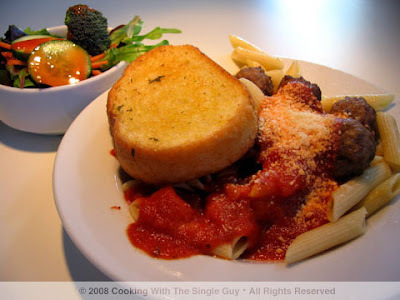 It was penne pasta in a simple tomato sauce (they called it marinara) with five meatballs and a piece of garlic bread. And of course the aforementioned side salad. Doesnt this look kind of like a kids meal? You know what? It tasted like it too. The marinara sauce was so bland; it tasted like it was straight from the jar. The meatballs were all right. It was tasty but not any better than what I can make at home. 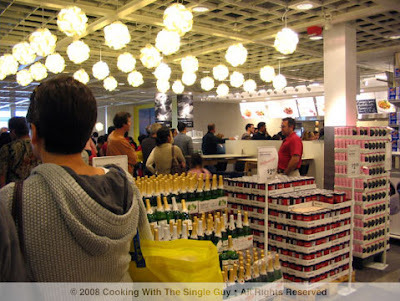 Overall, the Ikea food offerings are very much in line with its products: cheap and simple and doesnt last very long. I think the line is from the fact that there are no other food options inside the giant Ikea store and when youre exhausted from looking all around for a $2 chili bowl, then maybe a Swedish meatball doesnt sound that bad? 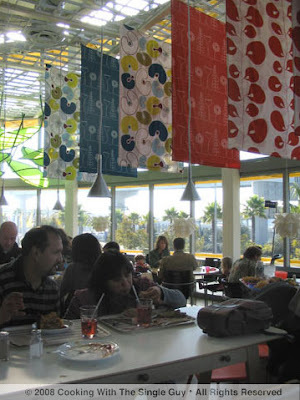 Ikea restaurant, 4400 Shellmound St., Emeryville. Open daily from 9:30 a.m. to 8 p.m. I call this photo "Bellpepper in Motion." It was taken during my black-and-white phase. I'm not sure how it happened. 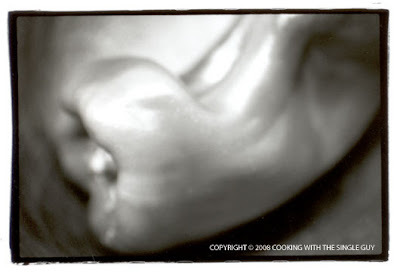 I was just shooting a photo of this really interesting bellpepper and when I got the photo back, it was blurry. But then I like the blur. It's kind of seductive. Maybe I'm staring at bellpeppers for too long. Dine About Town is in full swing in San Francisco. Its the Convention and Visitors Bureaus annual effort to pump up restaurants in a city where the locals really dont need much convincing to dine out. With prix fixe menus at a variety of restaurants available until the end of the month, DAT is a good opportunity to try some places you normally wouldnt. 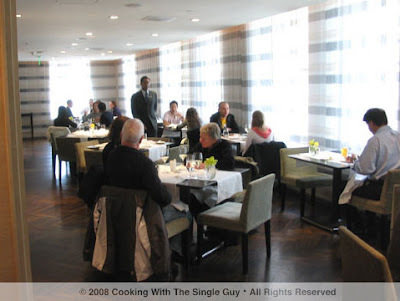 So when fellow food blogger Foodhoe and I talked about where we would go for DAT this year, we settled on Vitrine at the St. Regis Hotel adjacent to the San Francisco Museum of Modern Art. Its a restaurant I havent tried. One, because Vitrine is in a fancy hotel and that often translates to $$$$ dining. Two, its only open during the days, making it hard for me to get to from my Oakland office. Foodhoe and I decided to make a day of it. We both took Tuesday off from our regular day jobs and met up at Vitrine on the fourth floor of the St. Regis. 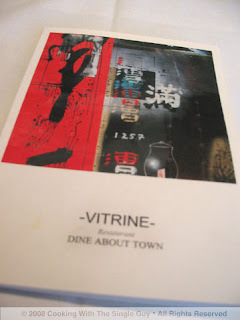 You really dont hear much about Vitrine because its often overshadowed by the larger and full-fledged restaurant Ame on the ground floor. But thats a shame, because Vitrine is just as elegant and dreamlike in setting. As you walk in, you feel like youre in a spa with the neutral colors and sheer curtains allowing the room to fill with sunlight. Initially I thought the elegant design and color scheme (which was reflected in the servers uniforms) bordered on boring. But then I realized that the muted colors served as the perfect canvas to showcase the food of Executive Chef John Jackson. The menu is light American-California cuisine with a sophisticated flair (the breakfast menu includes a black truffle omelet). The Dine About Town prix fixe menu typically comes with three courses, with lunch priced at $21.95 and dinner at $31.95 (tax and tip not included). At Vitrine, they offered a DAT lunch menu with two choices for each course. To start, Foodhoe and I both went in separate directions. Foodhoe got the escarole salad with bacon, lemon vinegar and a slow poached egg. She said she liked the creaminess of the salad with the flavor of the bacon. I got the prawn (ironically its listed on the menu as prawns but there was only one huge prawn), which was simply seasoned with salt and pepper and sautéed. 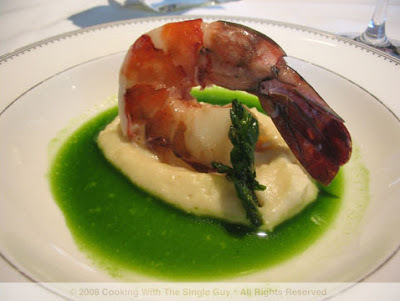 It sat on a buttery parsley root puree that was surrounded by a brilliant green parley juice. 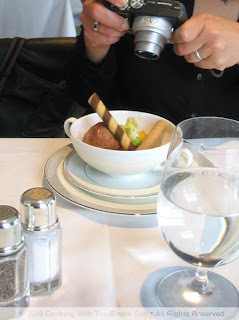 I especially liked the puree. 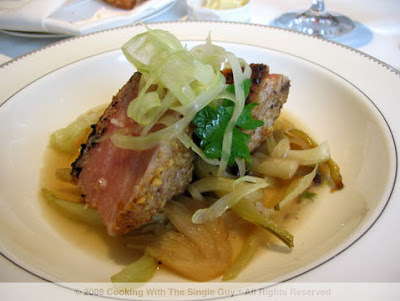 The tuna was fatty and juicy, which made it taste very much like prime rib. The fennel jus and accompanying fennel were elegant compliments to the tuna, neither overpowering or distracting from the actual fish. My few complaints were minor: 1) there were a lot of currants but they were difficult to pick up with a fork, and 2) my particular pieces of tuna were a little more on the done side than I would have preferred (while Foodhoes tuna actually looked perfect, with its seared exterior and ruby pink interior). Side note: The other option for the entrée that we both passed on was half of a heritage chicken. For dessert, Foodhoe and I went our separate ways again. She got the house-made sorbet, which included strawberry-basil and mango flavors. I got the butterscotch pot de crème. My pot de crème came with three Mexican wedding cookies. 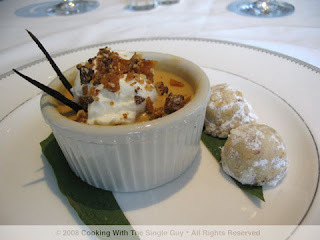 I loved the butterscotch pudding, which had a faint coffee undertone. I could have done without all the crunchy things sprinkled on top, but the overall dessert was a satisfying end to my two hour lunch! I wanted to also note that Vitrine has a nice selection of wine by the glass. Both Foodhoes Chardonnay and my Pinot Noir were very drinkable, offering up a slight complexity without the tannic kick start so often found in house wines. At the end of the meal I asked our server if I could see the regular menu out of curiosity, and I was happy to see that Foodhoe and I made a smart choice in coming to Vitrine during the DAT promotion. 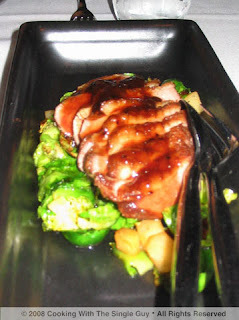 I saw on the regular menu that the Bluefin tuna was also offered as an entrée, but at the cost of $24. For the $21.95 we paid, we got the Bluefin tuna plus a starter and dessert. Now thats good DAT dining. Overall, the food was as advertised. Light and sophisticated. Chef Jacksons menu doesnt offer anything innovative or unusual, but its executed with a light touch to enhance the natural flavors of the quality ingredients. Despite the high prices on its regular menu, Vitrines solid food, beautiful environment and exceptional friendly service makes it a pleasant, special-occasion dining destination. 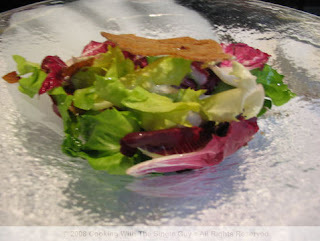 Go here to read Foodhoe's take on our lunch (including dramatic photo of the fennel jus pour!). NOTE: If you dont get to a DAT restaurant before the end of the month, dont worry. This year Dine About Town is split into two months. The second DAT will take place in June. What's Brewing At the Mint Plaza? Today I took the day off from work and met a fellow food blogger for a lunch near Yerba Buena Gardens in San Francisco (detailed review of that mid-week lunch coming tomorrow). 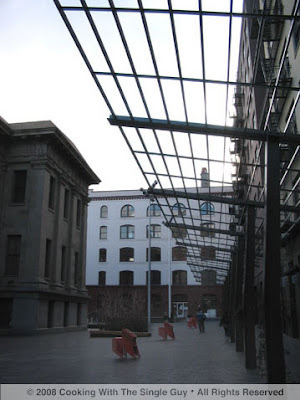 Afterwards I caught a movie at the Sony Metreon and then after that I walked around the new pedestrian mall known as the Mint Plaza. 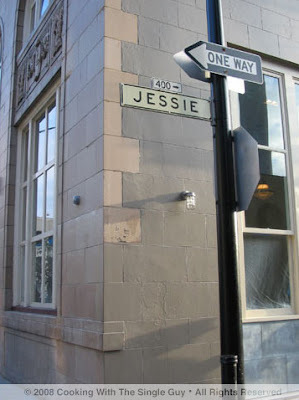 It was my first time at the tiny city space in what was once the Jessie Street alley behind the San Francisco Mint building at 5th Street near Union Square. It was a rainy and cold day so there were hardly anyone sitting outside enjoying the orange chairs set out for people to sit at the plaza. But still, some poor guy had to put out and then collect all the orange chairs. The rain broke by the time I strolled over to the plaza, so there were some nice sunset views through rain clouds overlooking the area. 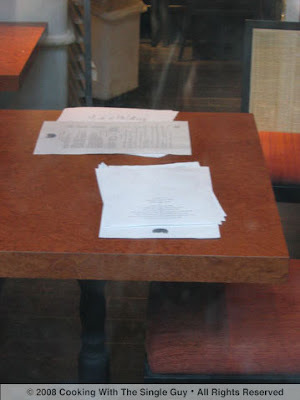 You can't really tell, but these papers I noticed on one of the tables in the second Chez Papa looks like menus. So it looks like they're at the stage where they're finishing up the details of what will be served. Sorry, I couldn't really get up close to actually read what's on the menu. 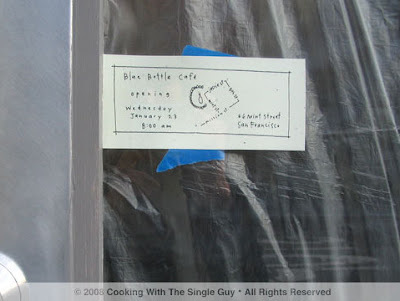 It's the first sit down cafe for Blue Bottle Coffee, the local organic coffee roaster that's popular at farmers markets around town. 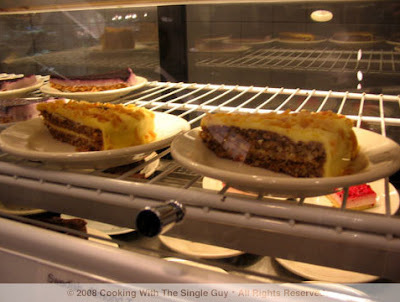 They're served at a lot of high-end cafes everywhere these days, and they've always had their first location out of a stand near my old neighborhood in Hayes Valley. But this will be an actual space where you can sit down and enjoy the coffee inside. You might not be able to read the small sign at the door, but it says it's set to open on Wednesday, Jan. 23, at 8 a.m. Curses, I'm just one day too soon! I couldn't really tell if they really are ready to open because the windows were all blocked out by plastic bags. But if you work around this area of town, check it out tomorrow and let me know! I dont buy canned soup any more now that I found how easy it is to make soup using my nifty handblender. Plus, canned soup isnt very healthy because of all the sodium thats inside to preserve it. I rather be the master of my own sodium. But because its mushroom season (and with our wet weather, were probably going to see a bit of wild mushrooms around for a few more weeks), it made me think of my all-time favorite soup when I was growing up: Campbells Cream of Mushroom. Sigh, it was so simple and tasty. My mom would let us eat as much as we wanted because it meant she didnt have to make us lunch. (Its funny how my mother would let us play with can openers and a hot stove.) I would sometimes mix the soup with some leftover rice to give it more bulk. 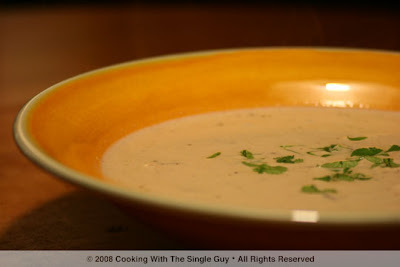 And, of course, Cream of Mushroom soup is the base for a lot of American comfort dishes. Im sure a lot of cans were used this past Thanksgiving for those green bean casseroles. Below is my recipe ala Cream of Mushroom soup. I used a mix of maitake and shiitake mushrooms I got at the farmers market and a whole bunch of crimini mushrooms I got at my Safeway, just to fill everything out. It turned out to be a comforting, earthy soup. (I also found mushroom broth at Whole Foods. I never realized they had mushroom broth, so of course using it in this soup just pushed the depth of this soup over the edge.) Go out and find a mix of fresh mushrooms and leave the canned soup on the shelves! Enjoy! In a large pot, warm 2 tablespoons of olive oil over medium high heat and sauté mushroom bits, adding a pinch of salt to help sweat the mushrooms. (Cook until you get slight moisture around all the mushrooms.) Remove mushrooms from pot and set aside. In the same pot, warm another 2 tablespoons of olive oil over medium high heat and sauté onion and celery for about 5 minutes. Then add white wine and cook until the wine is almost evaporated (about 3 to 5 minutes). Then add broth and water. Simmer for 15 minutes. Using a handheld blender or a food processor*, puree the soup base until smooth (goal is to get rid of any signs of the onions and celery). 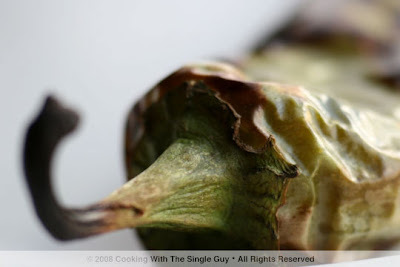 Return the mushroom into your soup and cook for another 10 minutes at a simmer. Then add cream and season with salt and pepper to taste. In a small bowl, mix the cornstarch with some water to create a slurry. Slowly add this to your soup to thicken. (It helps if the heat is on high to activate the cornstarch.) Ladle into bowls and garnish with chopped parsley. Makes 4 to 5 servings. Serve with parmesan cheese crostinis. PUFF IT UP: To dress up this soup, its fun to use the puff pastry trick to top it off. Preheat oven to 400 degrees. Defrost your frozen puff pastry per instructions on the box then roll it with some light flour to even it out. Then place the top of your soup terrine or bowl on the puff pastry sheet to cut an outline (leaving about one inch around the border of your bowls edge). 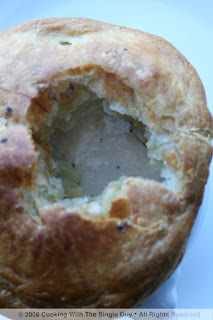 Ladle the soup into the terrine and then place the carved puff pastry sheet on top, stretching out the edges and pressing them against the side of the bowl. Using a small knife, cut a few holes for vents. Then use an egg wash (one egg mixed with a bit of water) to brush all over the puff pastry to help make it golden brown. Optional: Sprinkle some sea salt on the top of the puff pastry. Place the bowls on a baking sheet and but everything in the oven and bake until the puff pastry is golden brown (about 30 to 40 minutes). When done, let the soup bowls cool for about 10 minutes before serving.